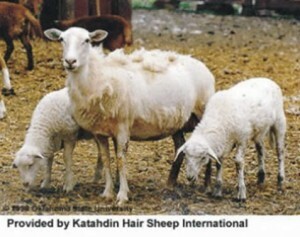 Katahdin sheep are a breed of hair sheep that was developed in the United States. The Katahdin breed originated at the Piel Farm in north central Maine where Michael Piel was an innovator and amateur geneticist who enjoyed raising livestock. His first intentions related to establishing a sheep enterprise were to use sheep to graze power lines instead of spraying or mowing the vegetation. He then developed other ideas on how to employ sheep for land management. In 1956 and 1957, Piel began making inquiries about hair sheep after seeing pictures in a National Geographic magazine of West African hair sheep. He eventually made contact with Richard Bond of the U.S. Agricultural Research Service in St. Croix, Virgin Islands who worked with hair sheep flocks on the island. The ram lamb, “King Tut,” was used for breeding a handful of ewes in December 1957, including Tunis, Southdown, Hampshire, Suffolk, and the “African” ewe lambs. From this point on, crosses of many breed combinations (including Cheviots and other “Down” breeds), were made as Piel tried to determine what would create the type of ewe he was looking for. He was particularly selecting for hair coat, meat-type conformation, high fertility, and flocking instinct. In October 1975, Piel imported a handful of Wiltshire Horn sheep from Wales via Canada. He intended to improve size and bone by incorporating the Wiltshire into the Katahdin’s. The first crosses were born in 1976. Paul and Margaret Jepson of Vermont had become acquainted with Piel while trying to locate Wiltshire Horn stock and decided the newly developed Katahdin’s would suit them better. They purchased some sheep from Piel in the mid-1970s and established the first satellite flock of Katahdin’s. The Jepson’s then experimented with incorporating St. Croix blood (another hair sheep breed akin to the original “African Hair” type) into their flock in the early 1980s. Heifer Project International, an international livestock development charity, took an interest in Piel’s work and his “improved” hair sheep. HPI realized that Katahdin’s were well suited to the southern U.S. and built a sizeable flock at their center in Arkansas through the 1980s based on stock from Piel Farm and Jepson’s. Michael Piel died suddenly of a heart attack in December of 1976. The Wiltshire Horn influence in the Piel Farm flock increased in the late 1970s as scale and bone improved somewhat. However, the undesirable presence of horns, decreased prolificacy and flocking instinct, and a flightier disposition resulted from incorporating the Wiltshire Horn. During the early 1980s, under the leadership of Barbara Piel and farm manager Charles Brown, flock selection was against horns. Katahdin Hair Sheep International was incorporated in 1985 as a breeder’s association and registry by Piel Farm, Heifer Project, and Donald Williams. The first inspection of animals for the original registry flock book was conducted in 1986. Stan Musgrave, an animal scientist from Maine familiar with the Piel flock, inspected all Katahdin’s known to exist across the United States. 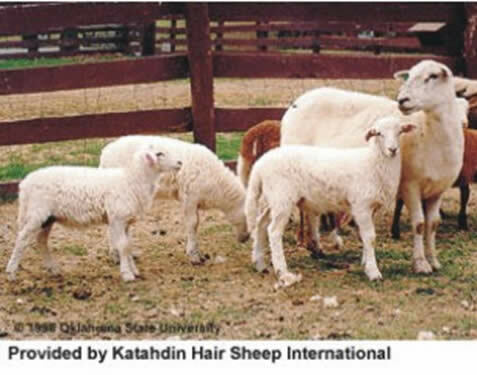 The first KHSI members were accepted in 1987, and 23 breeders agreed to join KHSI and register their Katahdin stock. 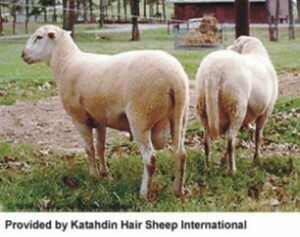 Katahdin are hardy, adaptable, low maintenance sheep that produce superior lamb crops and lean, meaty carcasses. They do not produce a fleece and therefore do not require shearing. They are medium-sized and efficient, bred for utility and for production in a variety of management systems. Ewes have exceptional mothering ability and lamb easily; lambs are born vigorous and alert. The breed is ideal for pasture lambing and grass/forage based management systems. They have demonstrated wide adaptability. They were derived from breeds that originated in the Caribbean and British Islands and the state of Maine was their original home. In cold weather, they grow a very thick winter coat, which then sheds during warm seasons. Their smooth hair coat and other adaptive characteristics allow them to tolerate heat and humidity well. Katahdin’s are also significantly tolerant of internal and external parasites and if managed carefully require only minimal parasite treatment. Katahdin’s are docile so are easily handled. They exhibit moderate flocking instinct. Live weight of a mature ewe in good condition usually ranges from 120 to 160 pounds; a mature ram will weigh 180 to 250 pounds. Average birth weight of twins is about 8 pounds. Ewes and rams exhibit early puberty and generally have a long productive life. Mature ewes usually have twins, occasionally producing triplets or quadruplets. A well-managed and selected flock should produce a 200% lamb crop. Rams are aggressive breeders, generally fertile year round, and can settle a large number of ewes in the first cycle of exposure. With selection a flock can consistently lamb throughout the year. The Katahdin ewe shows a strong, protective mothering instinct, usually lambs without assistance, and has ample milk for her lambs. Lambs produce a high quality, well-muscled carcass that is naturally lean and consistently offers a very mild flavor. Lambs are comparable to other medium-sized maternal breeds in growth and cut ability. Lambs are desirable for specialty markets at a variety of ages and weights. The wether’s are appropriate for conventional North American markets at 95 to 115 pounds. The hair coat of the Katahdin varies in length and texture among individuals and can be any color or color combination. It generally consists of coarse outer hair fibers and an undercoat of fine wooly fibers that becomes very thick and longer if cold weather sets in and day length decreases. This undercoat and some hair naturally shed as temperature and day length increase seasonally, leaving a shorter, smooth summer coat. The Katahdin can be used in crossbreeding programs. When crossed with wool sheep, the first generation offspring will in most cases have wool fleeces with hair intersperse. It usually takes at least 3 generations, depending on the type of wool sheep parentage, to obtain offspring with a shedding hair coat and other purebred characteristics.